On the same day, the most Divine Fathers appointed a commemoration of all those who, from ages past, have piously fallen asleep, in the hope of resurrection unto life eternal. This is one reason why the Church of God performs the commemoration of souls. A second reason is that, since the Fathers intended, as is fitting, to assign the observance of the Second Coming of Christ to the following day, they appointed a commemoration of all souls on this day, as if propitiating the dread and unerring Judge to show them His innate compassion and place them in the promised Paradise of delight. A third reason is that, since they intended to expound the banishment of Adam on the following Sunday, they devised the present commemoration, on this day of rest, as a respite from, and end of all human affairs, so that they might start from the beginning, that is, the banishment of Adam—for the final event that we will experience is the examination by the impartial Judge of all the deeds that we have committed in our life—and so that, putting fear into men thereby, they might make them ready for the contests of the Fast. We always commemorate souls on Saturday, because Sabbaton (Sabbath) means “rest” in Hebrew; and since the dead have rested from worldly and all other cares, we offer supplications for them also on the day which means “rest.” It has become customary for us to do this every Saturday. On the present Saturday, we observe a universal commemoration, beseeching God for all the pious. 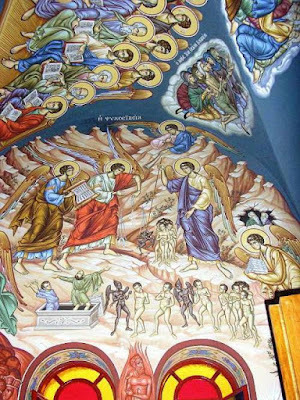 The Fathers, knowing well that what is done on behalf of the reposed, that is, memorial services, almsgiving, and Liturgies, affords them great respite and benefit, allow the Church to do so on both an individual and a general basis, a tradition which they received from the Holy Apostles, as St. Dionysios the Areopagite tells us. That what the Church does on behalf of souls benefits them, is clear from many sources, but especially from an incident in the life of St. Makarios, who was in the habit of praying for the departed and had besought God to reveal to him whether any benefit was conferred on them thereby. Finding the desiccated skull of an impious pagan on the road that he was traversing, he asked whether the souls in Hades experience any consolation. The skull replied: “We receive great respite, Father, when you pray to God for the departed.” St. Gregory the Dialogist even saved the Emperor Trajan through prayer, though he was told by God never again to make entreaty for one who was impious. In addition to this, through the prayers of the Saints and Confessors, the Empress Theodora snatched the God-hating Theophilos from torments and saved him, as we know from ecclesiastical history. St. Gregory the Theologian, in his funeral oration for his brother Cæsarios, states that supplications for the departed are beneficial for them. In one of his homilies on the Epistle to the Philippians, the great St. John Chrysostomos says: “Let us think of some way to benefit the departed; let us give them whatever assistance we can, by which I mean almsgiving and offerings to the Church on their behalf; for this affords them great profit, gain, and benefit. Indeed, not in vain or haphazardly have these practices been prescribed; it has been handed down to the Church of God by His all-wise Disciples, that the Priest should commemorate the faithful departed at the dread Mysteries.” Elsewhere, he says: “In your will, inscribe the Master as fellow-heir along with your children and kinsfolk; let your papyrus contain the name of the Judge, and let it not fail to mention the poor, and I will stand surety for you.” St. Athanasios the Great says: “Even if one who has died in the true Faith has vanished into thin air, call upon Christ God, and do not avoid lighting oil lamps and candles at his grave; for these things are acceptable to God and bring great recompense.” Observe these things, therefore, whether the deceased is a sinner, so that you might obtain for him forgiveness of his sins, or a righteous man, so that you might gain additional rewards. If perhaps he is a stranger and without means, and thus has no one to take care of him in this situation, yet God, in His righteousness and love for mankind, will provide for him on account of his penury in proportion to the mercy that He sees on our part. Besides, he who makes an offering on behalf of such individuals partakes of the reward, since he has shown concern for the salvation of his neighbor, just as someone who anoints another person with perfume makes himself fragrant first. In fact, those who do not fulfill what is commanded and enjoined in such situations will assuredly bring judgment upon themselves. We should know that at present, that is, prior to the general Resurrection, the souls of the Righteous exist in certain specially designated places, and those of sinners in another region, the former rejoicing in their hope, but the latter grieving in expectation of the terrors that await them, since the Saints have not yet received the promise of good things, as the Divine Apostle says, “God having provided some better thing for us, that they without us should not be made perfect” (Hebrews 11:40). It should also be known that not all who have fallen over precipices, or been burnt by fire, or drowned in the sea, or died from deadly poisons, cold, or hunger, suffer these things at God’s behest. These are the judgments of God, some of which happen by His good pleasure, but others by His permission, and yet others for the purpose of instructing, threatening, or chastising other people. In His foreknowledge, God sees and knows all things, and all things happen by His will, as the Holy Gospel says about sparrows (St. Matthew 10:29-31; St. Luke 12:6-7). However, He does not determine that things should happen in this or that way, for example, that one man should drown and another die by natural causes, or that one man should die in old age and another in infancy, but He decreed once and for all that there should be a general lifespan for humanity and so many different kinds of deaths. During this lifespan, various kinds of deaths are brought upon mankind, but God does not determine them from the very beginning, although He does have knowledge of them. In relation to the life of each human being, the will of God adumbrates both the time and the manner of his death. Although St. Basil the Great talks about a predetermination of life, he is alluding to the verse: “Earth art thou, and to earth shalt thou return” (Genesis 3:20). For the Apostle writes to the Corinthians: “[Because ye partake unworthily,] many are weak and sickly among you, and many sleep” (I Corinthians 11:30); the Prophet-King David says: “Take me not away in the midst of my days” (Psalm 101:25), and: “Thou hast made my days as a handbreadth” (Psalm 38:5); the Prophet Moses says: “Honor thy father, that thou mayest have length of days” (Exodus 20:12); and the Prophet-King Solomon says: “lest thou shouldest die before thy time” (Ecclesiastes 7:18). In the Book of Job, God says to Eliphaz: “I would have destroyed you, were it not for My servant Job” (cf. Job 42:8). Hence, it is evident that there is no predetermined limit of life. If someone says that there is such a limit, please understand that this limit is the will of God; for He adds years to one man’s life as He wills, but reduces them in the case of another, dispensing all things according to what is profitable for us; and, when God wills, He arranges both the manner and the time of death. Therefore, the limit of each man’s life is, as St. Athanasios the Great says, the will and counsel of God. St. Basil says that deaths are brought upon us when the limits of life are fulfilled, but by “limits of life” he means the will of God. For, if there is a limit to life, why do we beseech God and call upon physicians, and pray for our children, that they might live? 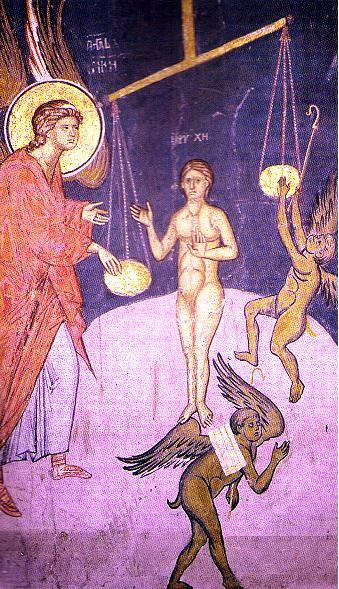 We should also know that when baptized infants die, they enjoy the Paradise of delight, whereas those not illumined by Baptism and those born of pagans go neither to Paradise nor to Gehenna. When the soul departs from the body, it has no concern for the things of this world, but only for the things of the Heavenly realm. We celebrate memorial services on the third day, because on that day a man changes his aspect, on the ninth day, because at that time his whole body decays, with only the heart remaining, and on the fortieth day, because on that day even his heart perishes. Appoint a place in the tabernacles of Thy Righteous for the souls of those who have departed before us, O Christ our Master, and have mercy on us, for Thou alone art immortal. Amen. Only Creator who out of the depths of wisdom lovingly govern all things and upon all bestow what is accordingly best for them, give rest to the souls of Your servants, for they have placed their hope in You, our Author and Maker and God. Give rest, O Christ, among the Saints to the souls of Your servants, where there is no pain, no sorrow, no grieving, but life everlasting.